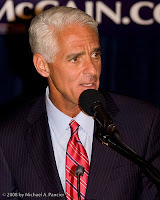 Alex Constantine's Blacklist: Will Donor Scandals Doom Crist's Senate bid?
" ... Three of Crist's top fund-raisers have been hamstrung by federal investigations in the past nine months, and a fourth, Jupiter sports agent and real estate investor Marc Roberts, is facing a federal lawsuit alleging he defrauded a business partner out of $100 million to support his own 'lavish personal lifestyle.' ... "